My first own dog Taitsu came to me when nobody else wanted her. She was named after my grandmother and she was a Big Person. Endlessly greedy, tramp with golden heart and a fabulous hare hunter. Taitsu had only one single thought in her head: Let's eat something, eh? She learned easily basics of obedience, but only if you had a big sausage in your hand. 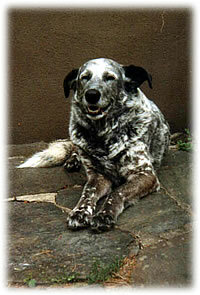 Taitsu's career as a show dog in unofficial shows began when she was already 11 years old. Success in dog shows was varying, because Taitsu really didn't care much about showing off but was usually standing like an old mule. But as a social dog Taitsu was always enjoying when something happened and you could smell barbecue.